Sankie Simbulan, Social Performance and Social Investment Manager, Pilipinas Shell; Ramon del Rosario, Vice President for External and Government, Pilipinas Shell; Cesar Romero, President and CEO, Pilipinas Shell; Fernando Zobel de Ayala, President and COO, Ayala Corporation and Co-Chairman, Ayala Foundation; Ruel Maranan, President, Ayala Foundation; Mariles Gustilo, Arts & Culture Senior Director, Ayala Foundation; Kenneth Esguerra, Ayala Museum Senior Curator, Ayala Foundation. 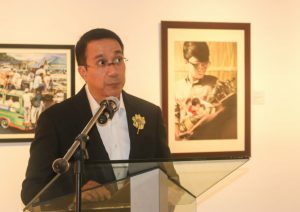 AYALA MUSEUM, MAKATI CITY—As part of Pilipinas Shell’s 50th Anniversary celebration of its National Students Art Competition, more than 200 winning masterpieces of the Shell art program were turned over to Ayala Foundation and is now part of the Ayala Museum collection. A ceremony was held on October 9 to officially mark the occasion. Present at the signing were Cesar Romero, President and CEO, Pilipinas Shell; Ramon del Rosario, Vice President for External and Government Relations, Pilipinas Shell; Ruel Maranan, President, Ayala Foundation; and Mariles Gustilo, senior director for Arts & Culture, Ayala Foundation. 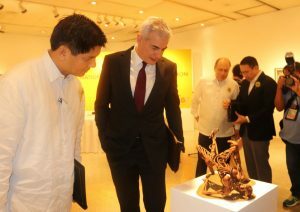 Fernando Zobel de Ayala, President and COO, Ayala Corporation was also present to witness the signing. 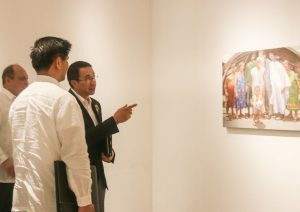 With the donation of significant pieces of Filipino modern and contemporary art, Pilipinas Shell has made a part of its 50-year legacy accessible to the public through Ayala Museum. The National Students Art Competition (NSAC), Shell’s art program, started in 1951. More than 38,000 college students have joined the art contest and from it emerged some of the country’s best talents, including national artists Jose Joya, Federico Aguilar Alcuaz, Ang Kiukok and BenCab, and emerging young artists like Ronald Ventura, Rodel Tapaya and Leeroy New. Part of the turned over collection is one of the earliest winning pieces from 1955. Other works include pieces from different categories—oil/acrylic, watercolor, sculpture, calendar, and digital fine arts. Since 2005, Ayala Foundation has been partners with Pilipinas Shell in presenting the 100 finalists of the annual competition through a two-week exhibition held at Ayala Museum. “This contribution is very much aligned with Ayala Foundation’s vision of forming communities where people are creative, productive, and proud to be Filipino. 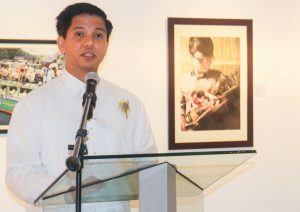 The existing partnership between Ayala Foundation through Ayala Museum and Pilipinas Shell furthers our cause of nation-building through arts & culture,” according to Maranan. Indeed, Ayala Foundation and Ayala Museum’s hope for this new collection is that it will bring about feelings of joy and wonder, spark curiosity, and create a feeling of pride for our Filipino talents as the arts & culture are made more accessible to the public. 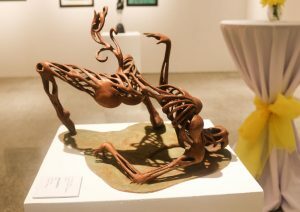 A preview of the 206-piece collection donated to Ayala Foundation; Leeroy New’s “Prima Materia” won second prize in NSAC’s sculpture category in 2004. Ruel Maranan, President of Ayala Foundation; Cesar Romero, President and CEO of Pilipinas Shell; and Ramon del Rosario, Vice President for External and Government Relations of Pilipinas Shell view “Masasayang mga Luha”, a 2006 winning entry from Jaypee Samson. 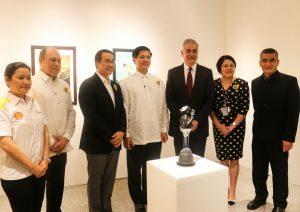 Cesar Romero, President and CEO, Pilipinas Shell and Fernando Zobel de Ayala, President and COO of Ayala Corporation and Co-Chairman of Ayala Foundation, preview one of the winning masterpieces by Leeroy New.